Visit Hidden Bench Estate Winery’s Tasting Room where you will discover our premium wines, many sold exclusively at the winery. Situated within the Beamsville Bench VQA sub-appellation, our premium artisanal winery is dedicated to crafting wine solely from our own certified organic estate vineyards. Our goal is to make wines with an uncompromising commitment to quality that Canadians can serve with pride side by side with the very best wines produced in the world. 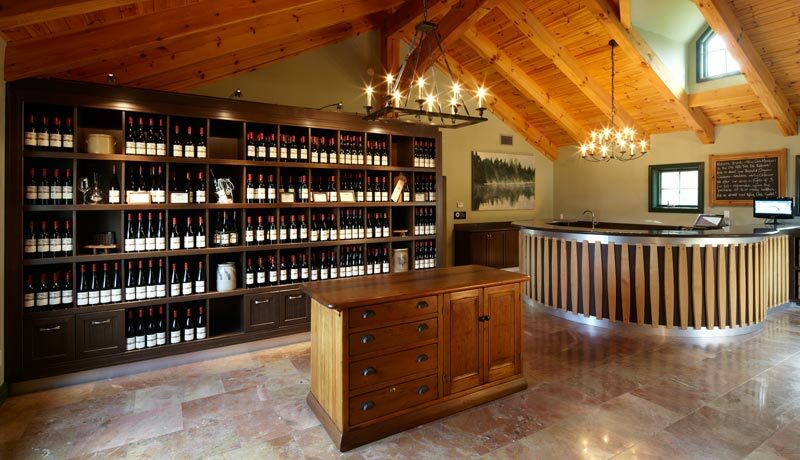 Hidden Bench is a small lot estate winery and our tasting area is equally intimate. For the comfort of all our guests we recommend you book your tasting appointment ahead of time if you are travelling with 4 or more people in your group. To make a reservation call us at 905.563.8700 ext. 24 or email wine@hiddenbench.com. Discover our organic viniculture programme, including a tour of our Locust Lane Vineyard or Felseck Vineyard (weather permitting) and a behind the scenes look at our production facility and one of our barrel cellars. Along the way we will share a few surprises with you that will make this a memorable and unique experience and which will be capped off by a seated, curated tasting of 4 wines in our Veranda tasting area. Reservations are required 24 hours in advance. This experience is offered daily at 11am. While enjoying the view from our veranda, delight your palate with any 4 wines we have available at the tasting bar paired with a tasting of locally produced cheese. One of our tasting associates will be on hand to share with you, as much or as little as you’d like, about our wine and winemaking style. Minimum 2 tastings per reservation. Reservations are required. Enjoy 4 of our Estate wines in appropriate stemware at our tasting bar. One of our tasting associates will be on hand to share with you, as much or as little as you’d like, about our wine and our winemaking style. One tasting fee is waived with each purchase of 3 bottles. Experience 4 of our very limited Terroir Series wines in appropriate stemware at our tasting bar. One of our tasting associates will be on hand to share with you, as much or as little as you’d like, about our wine and our viniculture practices. One tasting fee is waived with each purchase of 3 bottles. 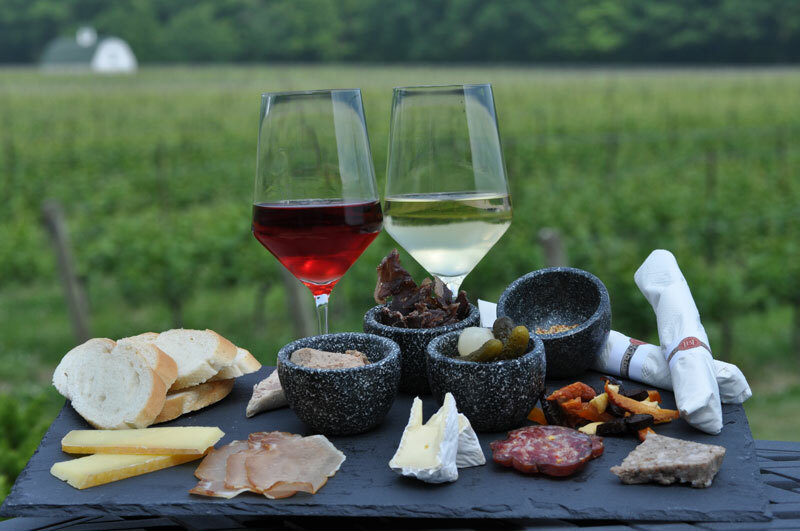 Join us for a glass of wine and charcuterie & cheese plate (food options available on Saturdays and Sundays only) on our relaxing patio (weather permitting) overlooking the Locust Lane Vineyard from May 15th until November. Daily from 11:00 to 16:00. Though we do not accept reservations for our patio, we kindly request that you call if you are joining us in a group of 6 or more. Travelling in a group? Let us provide you with a unique tasting experience! As a small winery with a small tasting room, we would like to provide the best experience to your group and our other patrons. As such, reservations are required for groups of 4 or more. Please contact us 24 hours in advance at 905.563.8700 or by email at wine@hiddenbench.com to book your group tasting experience. * While we hope you feel re-charged when you visit us, you can also re-charge your electric vehicle free of charge. We have both a universal electric charger and a Tesla charger at the winery for your convenience.